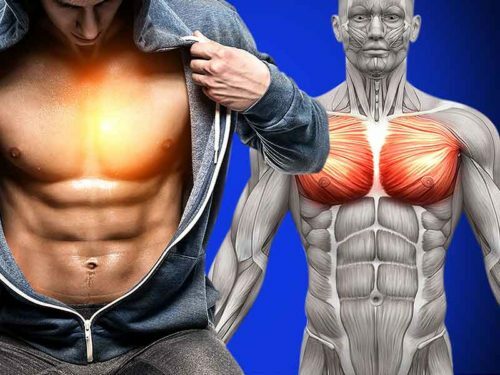 Instead of waiting for a bench to become free to perform your average bench press exercise, why not try these 6 exercises, that are more superior than the bench and also give you gratification of building your chest muscles. Don’t completely leave out the bench press, but instead incorporate these moves to not only give your workout new character, but it also means you are not waiting around. By performing these exercises you are also not putting to much pressure directly on your delts but can use surrounding muscles to help and gain mass. These exercises will provide you with the training variety which will help you stimulate the chest muscles from several different angles. As soon as you add these exercises into your training plan, we guarantee you will start getting a fuller and thicker chest in a very short time. The Svend press is a unique exercise because it’s done with a plate, not a barbell. The way you do it is by standing, holding a 45-pound plate at chest level and pressing the weight in front of you using both hands, while you focus on squeezing your pecs. Return the plate slowly back to the chest. This type of press will help you to better separate the inner part of the chest muscles. Push-ups are the quintessential exercise not just for pec development but as the most basic builder of overall body strength. You can make it a bit more challenging by doing it off a medicine ball or placing the feet on a higher ground to hit the upper chest area. Start the movement with the arms slightly wider than shoulder width. Lower yourself to the floor until the triceps positioned parallel to the floor. This a very simple and fun exercise primarily meant to stimulate the upper part of your pecs. To get into a right body position for this movement, put a classic Olympic barbell in some corner or if you gym has one, a landmine attachment. Next, put some weight plates on the other side of the barbell. Grab the loaded part of the barbell with one hand, get it up to your shoulder and beginning in a standing position, press the barbell upwards. This will especially stimulate the upper chest area. Dips are one of the most basic, simple, yet extremely effective movements. Go to a dip station, grip the bars on both sides with both hands and place them a bit further apart than conventional triceps dip grip. You should tilt the body downwards, not upright, in order to better target the chest muscles. All parts of the chest will be targeted when doing this movement. If you’ve reached a plateau in your bench pressing numbers, the floor press is a guaranteed method to overcome that plateau. Lie on your back on the floor, grab the barbell and press it upwards, the same as you would do in a standard bench press. The difference is that the reps end when the triceps touch the floor. This type of press will help you a lot in improving your lockout if you are having problems with it. The greatest thing about doing cable crossovers is that you can do them in many variations thus targeting the pecs from many different angles. If you want to activate the upper chest area place the cables in the more upright position. If you want to activate the lower chest area, put them parallel to your waistline.